It’s hard for me to believe we’re announcing Workday 14. When I joined Workday (just shy of two years now), we were preparing to deliver Workday update 9. It was also the beginning of our journey to build out talent management, now a robust solution in Workday Human Capital Management (HCM). As I type this post, my heart fills with pride and gratitude for being part of a fantastic team, and I continue to be in awe of our ability to quickly deliver great new features for our SaaS-based solutions that are actually adopted, since they’re part of our regular updates that go out to all customers. While Workday for iPad is getting a lot of interest, there’s lots more to be excited about with Workday 14, including a powerful feature that touches just about every functional area across our solutions: Embedded Intelligence. This is not the first time you’ve heard us extol the virtues of embedding information in business processes—Workday has long supported contextual views of information and analytics to help business users make better decisions. A good example of this is in our merit review process: During reviews, a manager has quick access to preview cards containing information such as where employees are in the performance range, if they are retention risks, and the last time they received bonuses. These features have been enormously popular—so much so that we frequently receive enhancement requests “to add a field here” or to alter the display to meet a customer’s organization-specific practices. In Workday 14, we’ve put the design power in the hands of our customers. Business processes throughout Workday now include landing areas for custom reports (we call them worklets). Customers can create up to five worklets per each business process step to provide even greater insights for decision making in context. We also tapped into the collective intelligence of the Workday Community to deliver pre-built worklets for all customers to use or modify, if they so choose. In terms of custom worklets you can create yourself—and very quickly—the possibilities are endless. Whether you choose to display supportive information/attributes, metrics, or sophisticated analytics, providing business users with information at their fingertips will undoubtedly shorten the time to make more objective decisions. It sounds a bit like motherhood and apple pie, I know. But it really is that easy to design a worklet. Just create it in Workday’s built-in report writer and designate where you would like it to appear—on a dashboard, the iPad, the iPhone®, in a business process step, or even a document. Did I mention worklets are real-time, dynamic, and don’t require a business intelligence data warehouse? Changing a field value in the process step will automatically update the worklet so you can see the impact of your decisions immediately reflected. Ah. I hope you can sense my enthusiasm about this feature. I rarely post about specific features, but this one is a force multiplier and I believe we have only scratched the surface of what is possible. 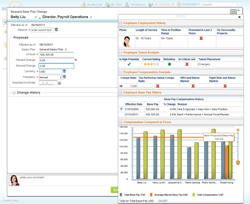 And don’t forget to check out more great new things with Workday 14, including enhancements for our Financial Management and Spend Management solutions, more performance assessment features in HCM, and new features for our public sector and higher education customers.